St Erme Parish Council and members of the community are working together to be better prepared for dealing with emergencies such as snow, major fire, or any other incidents that could have an effect on the community. 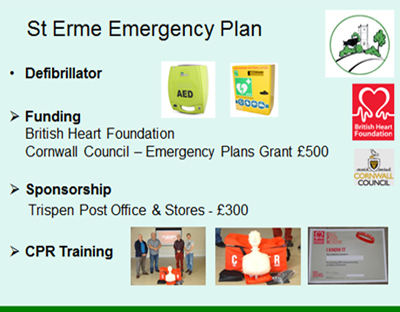 We were approached by Cornwall Council in 2010 to pilot community emergency plans and were the first community in Cornwall to complete and test its plan. We have 70 volunteers and wardens with different skills who can help in an emergency incident. If you want to know more about this project or would like to become involved in the Community Emergency Plan group, please contact Sally Trethewey clerk to the Parish Council. We aim to bring together our volunteers and wardens once a year to discuss issues and update the emergency plan. Cornwall Council recognises the work of communities, such as ours, and as early adopters of developing a community plan we have been rewarded with a grant of £500 from them which can be used towards helping the community. 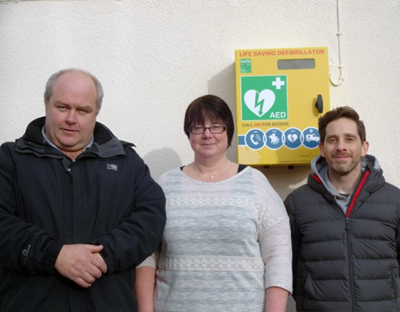 Following discussions with the group, it was agreed that a real asset to the Parish would be having a defibrillator located somewhere central to the village. 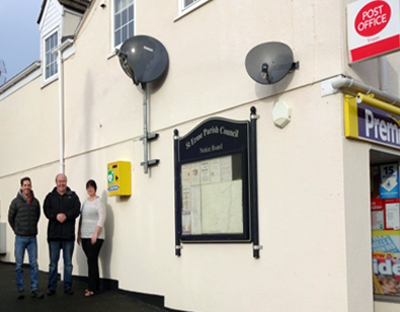 With a successful application to the British Heart Foundation, a public defibrillator unit and cabinet are now up in place at the Trispen Post Office and Stores. Defibrillation is one crucial stage in a sequence of events that need to occur for the resuscitation of a victim of sudden cardiac arrest (SCA). Having a defibrillator located in the community can help with survival rates in the crucial early stages and before the paramedics arrive on the scene. Mr & Mrs Matthews at Trispen Stores have kindly sponsored £300.00 towards the cost of this and agreed for the unit to be located on the wall of the village shop and will be picking up the ongoing electricity costs for the unit as their own personal contribution to this local initiative. This is a very kind gesture and very much appreciated. The group will be offering local people to come forward and undertake some training on using the defibrillator and CPR. Please click here which will take you to Cornwall Council’s ‘Community Emergency Plan’ website which will give you further information about our plan and emergency planning in Cornwall.